Kraken VC is a cost competitive club in the Greater Seattle market. Our teams train twice weekly and compete in at least 2 tournaments a month January thru April, and 1 in May, (14s & older). Kraken VC teams will participate in the Puget Sound Region Power League and Pacific Northwest Qualifier in Spokane at the end of March. Our Reef and Surf teams travel and compete in additional competitions outside of the Puget Sound and will also attend a post season tournament like the USA Volleyball Girls Junior National Championships, SoCal Summer Soiree and the Volleyball Festival in Phoenix, AZ. We opened our own new home in March 2018, that we have named The Lair Courts. A court volleyball competition and training center, home to all of club activities: team meetings, practices, strength & conditioning, private lessons, programs and club parties, The Lair Courts boasts 6 competition ready volleyball courts, 4 full size basketball courts, an Adidas & Baden Pro Shop with on-site custom apparel decoration, the Abyss'tro Cafe, full workout facilities, and PlaySight on-demand smart video system. The Lair is conveniently located 20-25 minutes from about anywhere in the Greater Seattle / Puget Sound area. Easy access to the I-5, I-405 & 167 freeways, and just 3 blocks north of IKEA. We have over 140 on-site safe parking spots, with another 800 in our immediate neighborhood. There are great food choices within a few blocks, including a drive-thru Starubucks, and we are just 3 miles from the Southcenter mall. We will hold our first 2018-19 Season Open House on Saturday October 20, from 10:00AM - Noon. All age group families are welcome to attend and check out our club and The Lair. We will have many of our coaches in attendance, with a focus on the younger age group teams, Mins 6-11 and U12-U14. 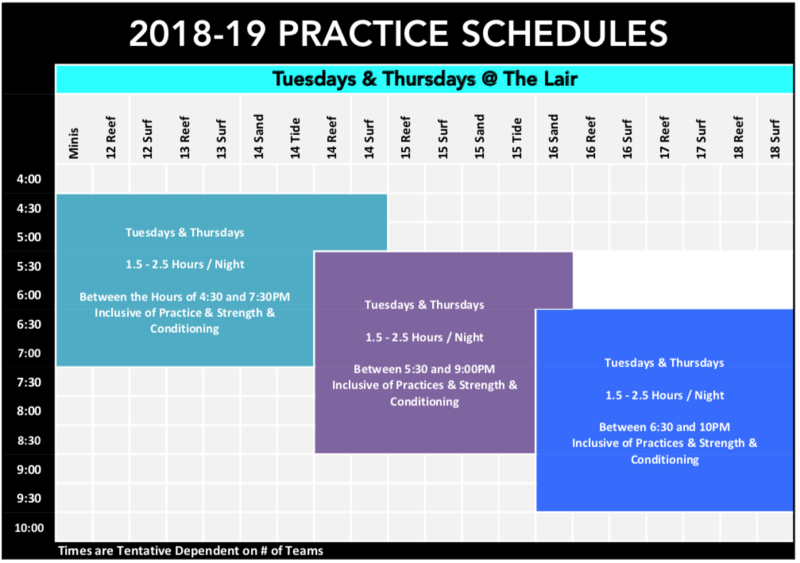 We will have a free open gym during this time for the athletes to get some play in with dedicated courts by age group, and will have a brief info presentation at 10:30AM. All Kraken teams will compete in 2-3 tournaments a month January thru April. All teams will compete in the Puget Sound Region Girl's Power League, with 5 play dates (4 for U12). All teams will also play over the President's Day Weekend or a regional tournament in February, Pacific Northwest Qualifier, Puget Sound Regional Championships, PSR Bid Tournament (if qualified, and most will play a tourney in early May. 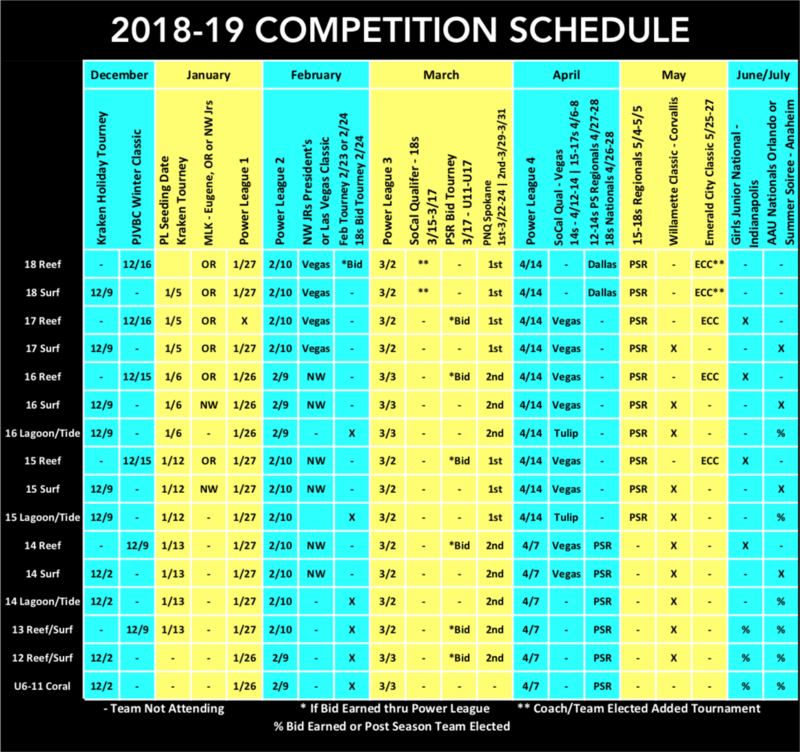 Reef & Surf teams have a more intensive competition schedule and will train and compete through late June / early July. Download a Printable PDF Version - Click Here! Details regarding our 2018-19 Season Tuition Costs and Payment Schedule for each age group will be posted below when announced. Signing Payment is due with completed player contract upon offer acceptance. dfclub handbook contract once an offer has been accepted. Visit the Fundraising section for more information of things in the works. 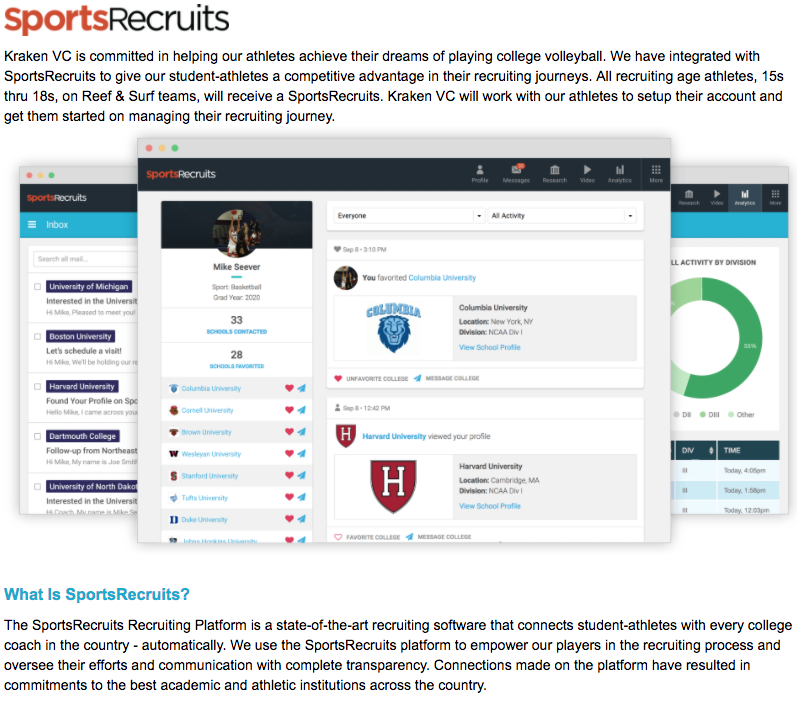 It is our goal to help families find financial solutions that will allow their athletes to play club volleyball. We have a limited # of partial financial aid awards available each season. Signing, travel and uniform paymens must be made in full, so please plan accordingly. All aid requests must be completed prior to tryouts. Any family that is awarded financial aid will be required to assist at The Lair Courts during hosted junior and adult tournaments. Concession stand, court monitors, apparel press operators, tournament director assistants and facility usher shifts are examples of required assistance shifts. In addition to Lair assistance, it is required that financial aid families take advantage of all fundraising opportunities at 110% effort. Failure to comply with these requirements may result in revocation of the aid award. Please visit our Tuition Page for complete details and link to the Financial Aid Application.